We also competed our battery test on the Jelly Bean-powered Galaxy S III and we are ready to share the results with you. As it turns out Samsung has managed to squeeze even more endurance out of that 2100 mAh battery pack after the update. The major difference comes with the improved standby time. While we are not usually comparing standby times, they are already part of our formula for the final score. So, even with the other results being close to the ICS ones, the standby overall improvement pushes the endurance rating even more higher. If you want to see our full comparison charts, head over to our dedicated blog post. 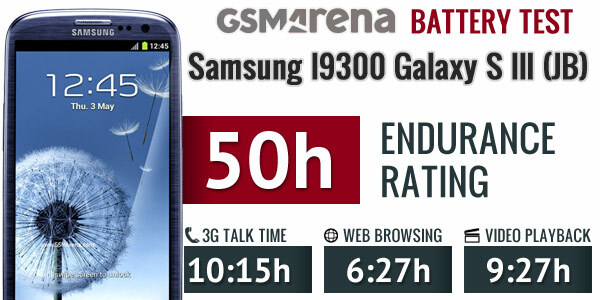 Samsung Galaxy S III running on Jelly Beangot an endurance rating of 50 hours (7 hours more than the ICS Galaxy S III), which means you’d need to charge it once every 50 hours if you do an hour of 3G talking, an hour of video playback and an hour of web browsing each day. That's quite an achievement, but keep in mind that your mileage may vary if you have different usage patterns. There is no question the Jelly Bean update represents a major step forward for the Galaxy S III. Samsung deserves some credit for not only bringing the update in a timely manner, but also making the transition pretty smooth. There are no bugs or newly introduced UI glitches to worry about – you just get to enjoy the novelties without distractions. You’ll even keep the Flash support if you had that before the update. Moreover, Samsung continues to include cool new software tricks of its own with the ROMs of its devices. The Blocking mode won't be available to the Galaxy S III rivals even after they get their Jelly Bean serving and we are not that sure about Flash support and pausing when recording video either. The update doesn't really revolutionize the Galaxy S III user experience, but the cool new tricks the smartphone learned help make an already extremely attractive package even better, so the Samsung flagship still finds itself in a great position. Now it will be able to extend its advantage over its quad-core rivals, which are yet to receive the latest version of Android. The Galaxy S III will also have some new weapons in its arsenal to repel the attacks of the newly introduced smartphone heavyweights like the Sony Xperia T and the Motorola RAZR HD. The Jelly Bean update, combined with an appropriate price cut might even help the Galaxy S III win the war against the LG Optimus G quad-core Krait beast, which will be running ICS when it launches. The performance battle is seemingly hopeless there, but the Samsung top dog won't give up on the throne without a fight. So, Samsung has once again raised the bar and it's up to the competition to catch up. 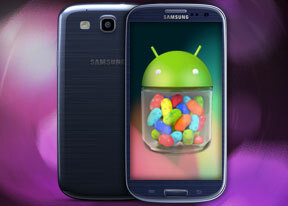 The Galaxy S III is now the only Android flagship smartphone to have the Jelly Bean goodies and time works in its favor. Here's hoping though that HTC, Sony and LG don't let this last too long and bring their top dogs up to speed as quickly as possible.